A compilation of recipes that are nutritious, tasty, easy to eat, and most importantly, a lot of fun for 2 to 12 year old kids! These finger foods are designed in such a way that they are non-messy and handy to serve to kids. 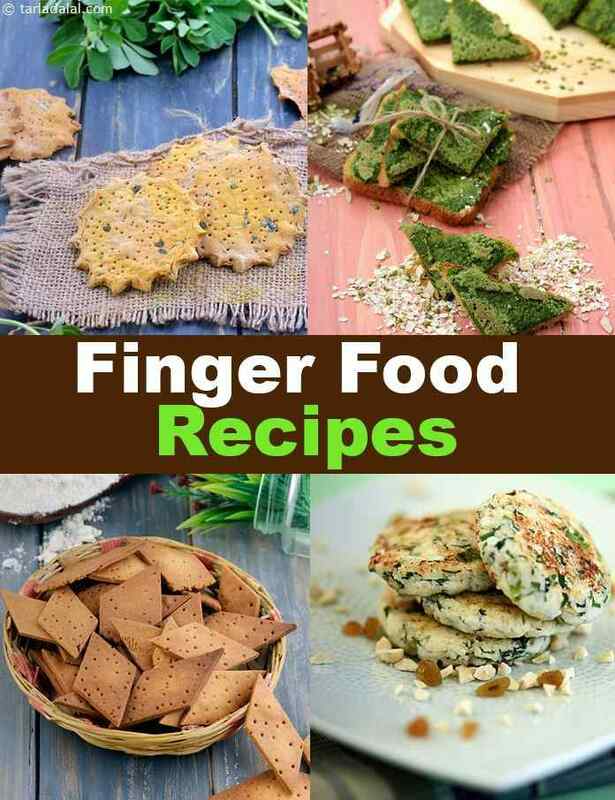 Interestingly, these finger foods are not only healthy but super-tasty, so your kids will not miss the junk food anymore. Try one yourself, and you are sure to like it too. In fact, many of these finger foods will be convenient for adults too, to enjoy over a chat with friends, or to serve with the welcome drink at a party. For mushrrom lovers a must try is Spinach Stuffed Mushrooms. Then make some healthy low fat fries for kids. Grilled Vegetables go great for finger foods from Grilled Cauliflower, Pumpkin, Grilled Broccoli and Grilled sweet potato. Nachni Sesame Khakhra and Bajra Methi Khakhra are good quick snacks. Sweet finger foods are a must and baked sweet shakarpara is a famous snack. Try Healthy Momos and Cucumber Snack.